Boulders Beach is a popular tourist attraction, for the beach, swimming and the penguins. The penguins will allow people to approach them as close as a meter (three feet), and so are much photographed. The closest relatives of the African Penguins are the Humboldt and Magellanic penguins found in southern South America and the Galápagos Penguin found in the Pacific Ocean near the equator. African Penguins like warm weather. 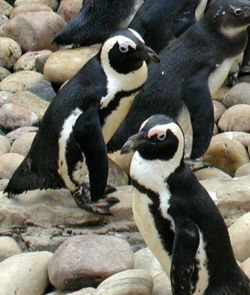 African Penguins grow to 68-70 cm (26.7-27.5 in) tall and weigh between 2 and 4 kilograms. They have a black stripe and black spots on the chest, the spots being unique for every penguin, like human fingerprints. They have pink sweat glands above their eyes. The hotter the penguin gets, the more blood is sent to these sweat glands so it may be cooled by the surrounding air, thus making the glands more pink. The males are larger than the females and have larger beaks, but their beaks are pointer than those of the Humboldt. They breed throughout the year, the main breeding season starting in February. Females lay two eggs, with an incubation period of 38-42 days. They are a monogamous species and the lifelong partners take turns to incubate their eggs and feed their young. The moulting season is between October and February, with the majority of the birds moulting in November and December, after which they head out to sea to feed (since they do not feed during moulting season and remain on land). Their diet includes small fish such as sardines and anchovies. The penguins obtain water from the fish they eat. African Penguins have an average lifespan of 10-11 years, the females reaching sexual maturity at the age of 4 years, and males at the age of 5 years. The highest recorded age for a bird of this species has been 24, however several individual birds have lived to be up to 40 years old in aquarium settings. The current population (as of 2003) estimated at 179,000 adults, with 56,000 breeding pairs. As recently as the mid-twentieth century, penguin eggs were considered a delicacy and were still being collected for sale. Unfortunately, the practice was to smash any eggs found a few days prior to gathering, in order to ensure that only fresh ones were sold. This added to the drastic decline of the penguin population around the Cape coast, a decline which was hastened by the removal of guano from islands for use as fertilizer, eliminating the burrowing material used by penguins. Penguins remain susceptible to pollution of their habitat by petrochemicals from spills, shipwrecks and cleaning of tankers while at sea. Disaster struck on June 23, 2000, when the iron ore tanker MV Treasure sank between Robben Island and Dassen Island, oiling 19,000 adult penguins at the height of the best breeding season on record for this vulnerable species. The oiled birds were brought to an abandoned train repair warehouse in Cape Town to be cared for. An additional 19,500 un-oiled penguins were removed from Dassen Island before the oil slick reached their island, and were released 800 miles up the West coast. This gave workers enough time to clean up the oiled waters and shores before the birds could complete their long swim home. Tens of thousands of volunteers descended upon Cape Town to help with the rescue and rehabilitation process, which was overseen by IFAW (International Fund for Animal Welfare) and the South African Foundation for the Conservation of Coastal Birds (SANCCOB), and took more than three months to complete. Although this was the largest animal rescue event in history, more than 91% of the penguins were successfully rehabilitated and released - an amazing feat that could not have been accomplished without such a tremendous international response. The African Penguin is one of the species to which the Agreement on the Conservation of African-Eurasian Migratory Waterbirds ( AEWA) applies. African Penguins on Boulders Beach near Cape Town.